The main advantage of a salt water pool isn’t that it doesn’t use chlorine. In fact, a salt water pool does use chlorine to keep the water clean. The advantage is that the pool owner doesn’t add chlorine to the pool-that means no pre-packaged chlorine, and less irritation for people who are sensitive to the added chemicals. Salt water tends to be much softer than chlorinated water, so it’s much more pleasurable to swim in, and is much less harsh on your skin. In addition, a salt water pool usually has a much lower concentration of chlorine than a chlorinated pool. Another important benefit is more of a long-term one. In the short term, converting from chlorine to a salt water pool will involve some cash outlay, since there are a few system components you’ll need to by. 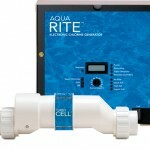 It’ll run approximately $1400-$1800 to convert a traditional chlorine system to a salt water system. Over two or three years however, the money you spend is recouped due to not having to buy extra chlorine for the pool. Just a bag of salt which is much less expensive. Just to be clear though, salt water pools do in fact use chlorine to sanitize the water. So if you are not adding chlorine tablets or shock, how does that work? A Salt Chlorinator manufacturers its own chlorine when pool water passes through the electrolytic cell. It works because of the chemical composition of salt, which is made up of chlorine and sodium. 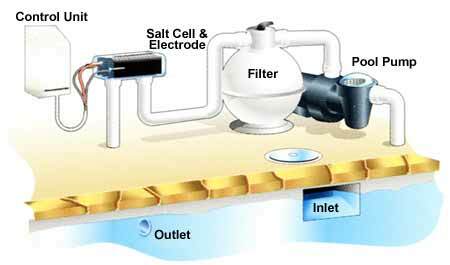 Within the salt water system is a unit called a salt-chlorine generator, which uses electrolysis to generate chlorine by separating the sodium and chlorine molecules in the salt you add to the pool. As the generator unit separates out the chlorine, it’s returned to the pool, where it keeps the water clean and sanitary. A well-maintained salt pool is an absolute delight to swim in with softer, more comfortable water that doesn’t irritate. It doesn’t taste salty, either, as you might think, because it has such a low concentration of salt that it’s officially considered to be fresh water! In the ocean, the salt concentration is between 20,000 to 35,000 parts per million, whereas in a salt water pool, it’s just 2,600 to 3,200. Finally, don’t be fooled into thinking that a salt water pool maintains itself. It doesn’t. You still need to check PH levels and carry out other maintenance tasks. However,you’ll benefit from lower maintenance costs and a more enjoyable swimming experience, which definitely makes it worthwhile.